Review by AllTheBestFights.com: 2018-06-16, disappointing fight between Gavin McDonnell and Stuart Hall: it gets two stars. Gavin McDonnell entered this fight with a pro record of 19-1-2 (5 knockouts) and he is ranked as the No.17 super bantamweight in the world. He suffered his only loss when he faced Rey Vargas last year (Rey Vargas vs Gavin McDonnell), after this bout he has won over Simas Volosinas, Jozsef Ajtai and Gamal Yafai (Gamal Yafai vs Gavin McDonnell). His opponent, the former Ibf Bw champion Stuart Hall, has an official boxing record of 21-6-2 (7 knockouts) and he entered as the No.35 in the same weight class but he lost two out of his last three fights, against Lee Haskins (Haskins vs Hall 2) and Paul Butler (Paul Butler vs Stuart Hall 2); between these two bouts he beat Jose Aguilar. 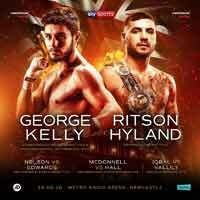 McDonnell vs Hall is valid for the WBC International super bantamweight title; undercard of Josh Kelly vs Kris George. Watch the video and rate this fight!